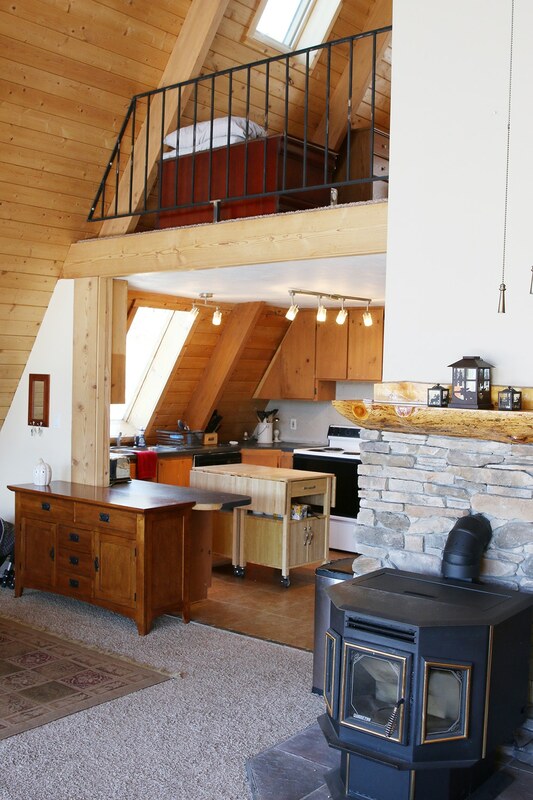 For those just joining us on these topics, the cabin is heated by a pellet stove (seen in the image above) for the top two floors, and a barely functional wood burning stove in the basement. I say “barely functional” because it takes a blazing hot fire about 3 hours of full court press to get the temperature in the basement up to 55 degrees. This has rendered the basement pretty much useless all winter. And the fact that there’s no cooling to speak of has rendered the top two levels pretty much useless during the summer. “Hot” does not begin to describe it. It gets like 90 degrees in the loft, and is miserable. So we’re going to take you along for the ride as we add a propane furnace, true air conditioning, new propane fireplaces, and make it all happen *hopefully* without having to take down any sheetrock or add a drop ceiling in the basement. But so long as we have contractors are up there, why not break out the concrete slab in part of the basement and run some plumbing? Cool, let’s do it. We’ve talked over this space for hours, and that’s no exaggeration. 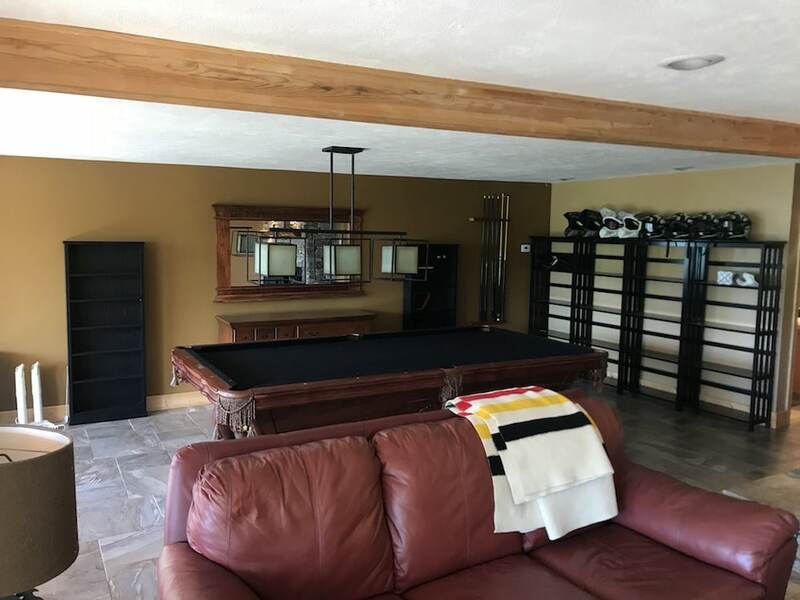 Do we want a pool table or ping pong table? Is this pool table our style? What storage can we do that would be better than a bunch of shelves? What if we turned it into a theater area? What if we just crammed in as many bunk beds as would fit? But every time we worked our way through an idea, we’d end it with a shoulder shrug and a “meh.” Nothing felt like “it”. Then, we found ourselves standing right about where the camera was for the picture above. Just looking out the windows at the reservoir. Then Jules said, “I wish we had a bedroom in this cabin with that view.” And that was it. To give some orientation, the left side wall is the windows looking out over the reservoir. You can see the wet bar/kitchenette facing out toward the common area, with the bathroom on the other side of that wall. In this version the bathroom is a little more open, but there’s no closet for hanging clothes. The bed size in the sketch is queen, and everything is pretty close to scale (10in per grid square). And while there isn’t built in storage for guests in this one (we plan to rent this cabin out), we can probably find some sort of storage solution for the bedroom side. For this version, the bedroom and wet bar/kitchenette have the same footprint, but we’ve moved the bathroom items around a bit. We opted for a smaller vanity and tucked it up next to the toilet. The shower is a bit more narrow, but also longer – perhaps allowing for two shower heads. We’re able to get a hanging rod and dresser in here, along with a tall linen cabinet. So even though the bathroom will feel a bit more tight, there’s also some functionality added that might be nice. And that’s where we’re at. All of the plumbing drains for this cabin run right below this area, so getting new drains where they need to be shouldn’t be an issue. We’ll turn one of the large windows into one that swings open, for egress, and hang some curtains wall to wall for privacy when desired. So what are your thoughts? If you were going to rent a cabin for a few days, would you want a closet in the bathroom to hang things up, or do you mostly just set your suitcase up on a luggage rack and pull things out when needed? We’d love to hear your feedback and, maybe other ideas we haven’t thought of. Either way, we can’t wait to sleep in this new bedroom and wake up to that view. I opt for functionality. I love being able to unpack and put my clothes away when on vacation. You feel more at home and settled rather than rifling around in your suitcase all week. Also – vanity storage! Hate it when my toiletries/makeup/hair appliances clutter up the top of the vanity because there’s no storage here! Good luck – exciting watching the progress! Here’s what I like/need when travel: 1) 2 drawers per person, 2) small closet to hang a few items, plus floor space to tuck away suitcase and shoes 3) bathroom that has 1 sink, but ample counter space as i’m usually travelling with more than 1 person and i would rather the vanity area have space for toiletry bags than 2 sinks, 4) stand-up shower is fine – no need for double shower or tub (although i’m sure a tub would be great for people with kids) – with a small ledge or bench for shaving legs :), 5) lots of hooks for towels, swim suits, etc. Honestly when i travel, a bathroom isn’t a huge deal for me because i’m not generally there for a spa experience, just need it to be functional. If you can orient the bed toward the view, do it! that is what people will remember. I personally never really unpack, but do always like to have the option. I’d go for a nice stylish clothes rack in the room. I never mind sharing bathrooms with more people than usual while on holiday, so would nix the idea of a full en-suite bathroom as there’s already a bathroom on that level. Plus, I personally dislike closets in a damp bathroom. You could then have a walk-in closet where you now plan the bathroom with just a sink. We always unpack – though a luggage rack and a clothing rack is plenty for us. Most vacation rentals we’ve enjoyed, usually require sharing the bathroom. So having a closest in the bathroom does complicate things a bit more when it’s occupied and you can’t get to your stuff. Along the same lines of a shared space, we always appreciate a rental that has plenty of places to hang towels and wet suits! Also, if this is the only bathroom in the basement, would you consider a door that opens to the common area as well? I know that takes up wall space, but I don’t like walking through someones personal space to get to a bathroom. No matter what you guys do, I know it will be beautiful and I can’t wait to see the results! I always hang things, always! If I’m driving, I also often just pack hanging things in a garment bag so I can hang them immediately and not have to spend much time putting things onto hangars. If you nix the bar, I’d do a bar that comes straight out of the wall somewhere, like you see in laundry rooms or super small hotel rooms sometimes. For a vacation home you don’t need much, but I absolutely need something to hang things on to keep the room from looking like a huge mess. What about if you have just a mini fridge under the counter immediately adjacent to the sink so you could cut the wetbar area down to about 2/3rds the current size and use the additional area where the fridge would have been to gain space for a closet? Though I do agree with those clamoring to rotate the bed to face the view. Ask and you shall receive. I unpack. Into drawers never the closet. I could do that in drawers built into the bedframe and be fine. I do like being able to get into the bed from both sides so I dig the layout. Is there a way to adjust the measurements of the bathroom so you can include a small closet accessible from the bedroom? Even if it can only fit ten or so hangers. Similar to others, I’m not a fan of closets in the bathroom. Excited to see this come to fruition! See the above weblink for a dresser/headboard idea. Also I’m kinda confused– the wetbar for outside deck entertainment- is a great idea yet I don’t see the rest of the basement fun area in the sketches. Is the new bedroom with a view taking the whole basement? If yes, then I would put a small. dorm size, refrigerator in the room with bottle water available for guests. Then just add throw pillows on top of the twins & keep extra blankets & sleeping pillows in the drawers underneath the bed. On a wall away from the beds, provide a counter with an outlet nearby with a hot air pop corn popper & a couple of big bowls & a jug of popcorn kernels. On shelves above the counter, provide some board games for kids of all ages- Candyland, Clue, Guess Who, Whoonu, decks of cards, etc. A stylish trash can nearby would be great so you don’t have to go upstairs. Do ask rental guests to remove all trash upon checking out and tell them where to take it. I rented a condo this Summer and I was hoping for a dvd player instead I was told it was a smart TV and thus people could bring their Roku Sticks, their Amazon or Netflix accounts. Just thought I would share so you can decide what you’d provide- cable, no cable, dvd player & people bring their own movies, etc. Have fun creating the basement to your heart’s delight!! Then you can have your larger bathroom and the bed will feel like a cozy little nook. Since theres already another bathroom off the living space, I think it’s great to make this one the master! I also love the idea of adding a wet bar to the living area! That will be so functional. I’d say nix the wetbar, and have the bathroom accessible from the living area instead of making it an ensuite. Turn the bed so it faces the view. The view was the whole reason you wanted a bedroom down there, so I think the bed should fully face the windows. Agreed! Bed facing the windows would be the high point. I always unpack if I’m staying more than one night (and sometimes even then), so I’d prefer not to live out of my suitcase. A chest of drawers would work, however, because like someone else mentioned, the clothes I’d wear to a cabin aren’t going to be precious and require hanging. That said, make the chest of drawers a good size because jeans, sweaters, etc., are bulky. Wait, I have a totally new idea! Move the entrance door to the room basically to the windows. Make the bedroom smaller but able to face the bed so that it is actually facing the view. With the added space now have a closet that you then walk through to the bathroom! Although I think the wetbar is an awesome amenity to have down there, it just seems like you’re trying to fit too much into one space and I wouldn’t sacrifice bathroom/closet size for it. I would nix the wetbar and have the bathroom accessible from the living space so you can get the bed facing the windows. Is there another place downtstairs you can have a second fridge for overflow of drinks/food? Just realized you already have a bathroom down there accessible to everyone – I would make that one bigger and more lux, keep the wetbar idea, and get rid of the new bathroom you were planning. Should give you enough space for some sort of storage for hanging clothes/suitcases. It’s hard to tell with out the whole space to scale, but is there a way to turn the bed so that it completely faces the view? Then build a wall behind it for closet storage, linen closet, suitcases etc, and then have a pocket door into the bathroom? Then a door into the bedroom that opens so that you see the bed? I’m not sure if there’s enough clearance for that and then to walk around the bed on both sides. But I’ve seen the “behind the bed storage wall done (I think on the IKEA site somewhere), and I just thought, hey there’s an idea. Then have the lights mounted on the wall above the bed, with some sort of shelf or cube on each side of the bed for glasses, phones, book, water glass, clock. And while I don’t know that a whole wet bar is necessary, I really, really like the idea of a fridge and, a way to make coffee or tea in the morning. So having a water source nearby is really useful. Being a cold climate, I’d like somewhere to hang coats. I don’t think you need a closet, per se, but lots of hooks and maybe a coat rack? I’m always looking for places to let fleece dry out if I’ve been hiking, etc. It drives me batty that more hotels don’t have several hooks in a room. 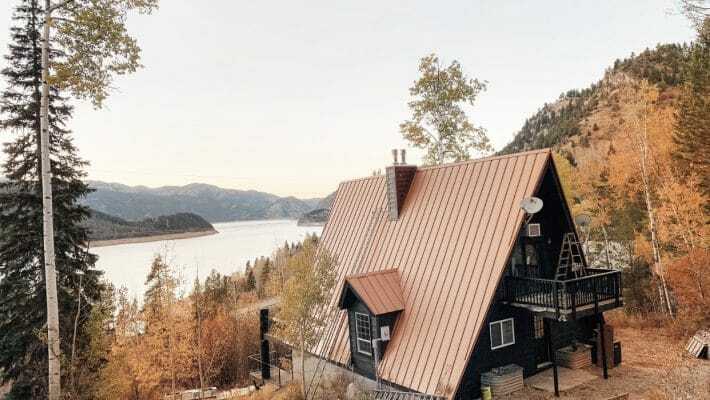 These are the niceties, but in a mountain cabin with a beautiful view for a few days I could sleep on a pull-out bed and use the bathroom down the hall. When it comes down to it, since you’ll probably be spending more time there than renters, a space that works for you is best — I’m sure you’ll make it beautiful. When we travel we like to have a few drawers to unpack in. Occasionally I’ll hang up a nice outfit. It’s just nice to be able to tuck your suitcase away. As a guest, I’d be perfectly happy with a small dresser and a couple of hooks on the back of a door. I think we stayed somewhere where the nightstands served that purpose which was fine by me. I’d rather have a bigger bathroom if I’m going for a chill weekend. I’m going to voice, what will probably be, the least popular suggestion. I think you should either nix the bedroom idea, or give it more square footage. As is, it just looks like you are trying to cram it in. Yes, the view is spectacular, and I would love to wake up looking at it, but is the bedroom going to he too awkward?? Just my two cents. Good luck, and I’m sure whatever you do will look beautiful. I vote for no closet. A big bathroom is so luxurious. Can’t wait to see what you do. I’m sure it will be gorgeous. Seems I am in the minority, but I hang basically all of my shirts and if I’m going somewhere I often just bring them on the hanger and then hang them. I also do unpack if I’m in a weekly rental, which I just did at my beach house. I do like storage in the bathroom as well. I think it is a great idea to add the bedroom/bathroom and I’d definitely go with the closet one. Well, I think you need some sort of a closet but I’m not a fan of and wouldn’t use a closet that close to a toilet and steamy shower. Is there the possibility of arranging the room so that the door to the bathroom area isn’t right in the middle of the wall? What I’m picturing is a a door that’s a closet’s width away from the edge of the wall, on one side of a short hall is the closet, on the other side is the bathroom. The bathroom would kick over behind the end of the hall so the toilet would be enclosed and the bathroom would be able to have a more spacious vanity and a bathtub. My kids are young and while I don’t take a bath while staying in the cabin, I put my playing all day, dirty kids in the tub each night before bed. Of course you’d have to lose the wet bar area but on the plus side the bathroom and closet would be really nice. I saw above that you seem to be a big fan of the wet bar but personally, it’s one of those things that I would never compromise a bathroom layout to have. When I am on vacation, I rarely hang things up. All my stuff goes in drawers. I think you could easily get away with just doing some sort of hook or two in the bedroom that people can put a hanger on. I love this idea and agree! Suitcase can sit open for those who like that option, drawers for people to unpack the majority of their stuff, and wall hooks for those that need to hang a few items. We had the exact same dilemma. We recently moved into a home with a long bedroom with a bathroom behind it, also with a fantastic mountain and city view we wanted to take advantage of. We are having a custom built-in dresser floating in the room to act as a sort of pony wall to create a spot to put the bed against while leaving an ample walkway to get to the bathroom behind it as well. If your sketch is sort of to scale, it looks like you should have just enough space to be able to do this, but not have any nightstands. Keep the headboard low and the dresser low and you can have the top of the dresser double as a place for lamps that you can access while staying in bed and put your phone, water, etc on there while you sleep. While you’re doing all the plumbing in the floor also have electrical run to where you will put the dresser for outlets on the dresser for the lamps and phone chargers. Plus then you have all the storage a long dresser provides. Pocket doors are your best friend to allow for unobstructed walkways both into the bedroom and bathroom. First of all… love the idea of putting a bedroom down there with that view! Personally, when I stay somewhere more than a night I want to unpack. Drawers for sure and somewhere to hang a few things. I don’t think you need a full closet, but a dresser and small hanging rack or valet rods for sure. I don’t love the idea of the “closet” in the bathroom. I know this is something you guys have in your home, but it would put me off. The tiny vanity also wouldn’t have counter space for toiletries, etc. which seems annoying. I agree with other comments about eliminating the wet-bar in favor of more space for the bedroom/bathroom/closet situation. 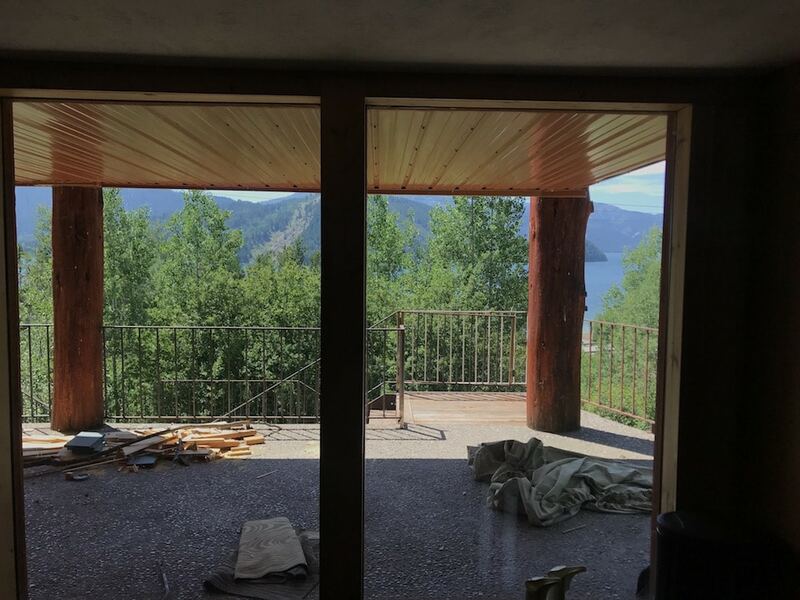 It seems like it would be a bit of a missed opportunity to go to all the trouble of putting in a bedroom with that deck and view, only to have the space be cramped and not very functional. I get wanting to have somewhere to store drinks/snacks… but could you find another area in the living room to build in cabinets and a bar fridge instead? I don’t think you really need the sink. I say all this coming from the perspective that you are planning to rent it out…. if it’s just for your own personal enjoyment then you should absolutely do what makes the most sense to you! But, this is also your vacation home, so set it up where you feel comfortable living there for 1-2 weeks at a time. Otherwise, would you just feel like that you are a temporary guest in your own home? First of all — so jealous!! My two cents…. – put a hanging rod with drawers underneath opening into the bedroom in the space where the fridge used to be. This really opens up your bathroom layout choices. – double doors centered so bed is focal point – maybe with obscure glass for more natural light?? We are staying in a vacation rental with friends right now. This time, they get the nice master bedroom, so we have a smaller bedroom with a pocket door (well, technically a barn-style door). Ugh. It’s right off the common space. Double ugh. And it has opaque panels to let in natural light since the bedroom is built into a hillside and has a window well. Triple ugh. Our kids seem to have a knack for opening that door right when I am trying to shimmy into my swimsuit, and when we sought some, er, private time last night, we were sure they were about to awaken and slide open the door at any moment. And the opaque panels mean that the light from the TV came in once I went to bed, and the daylight from the common room poured in while my husband was sleeping in a bit this morning. So if you go for a sliding door to access the bedroom from a common space, make sure it latches in some way and skip anything that makes it less private. Oh and I absolutely love a dresser when I am vacationing. This room has an Ikea Kallax 4 cube with 2 inserts and that’s OK. Since my kids are super early risers, it would be great to have a separate space, away from the central kitchen, to get them a little early breakfast while the rest of the house snoozes. And while I’m at it, what is it with the lack of bedside lamps in so many rentals? We had to take one from the master to read the kids bedtime stories. You are so intentional with your design, I know you’ll take all those details into account, but now I can start my day fresh since I’ve kvetched all over the place in my comments. Can’t wait to see how it comes together. I love the idea of a wet bar, but I think it might be too much to incorporate there (maybe in lieu of the closet just across from there?). I just rewatched the tour video and I think there are other avenues that could be explored. There is already a full bathroom, does this plan mean that there would be 2 full bathrooms in the basement? I’m thinking if you are going to be ripping up the concrete to run plumbing, this is a chance to determine if the laundry space is right, and if the other full bathroom is right for your purposes. I love love love the idea of a bedroom with that view. To have that, it might be worth sacrificing different spaces in the basement. But as it is, everything looks really tight. 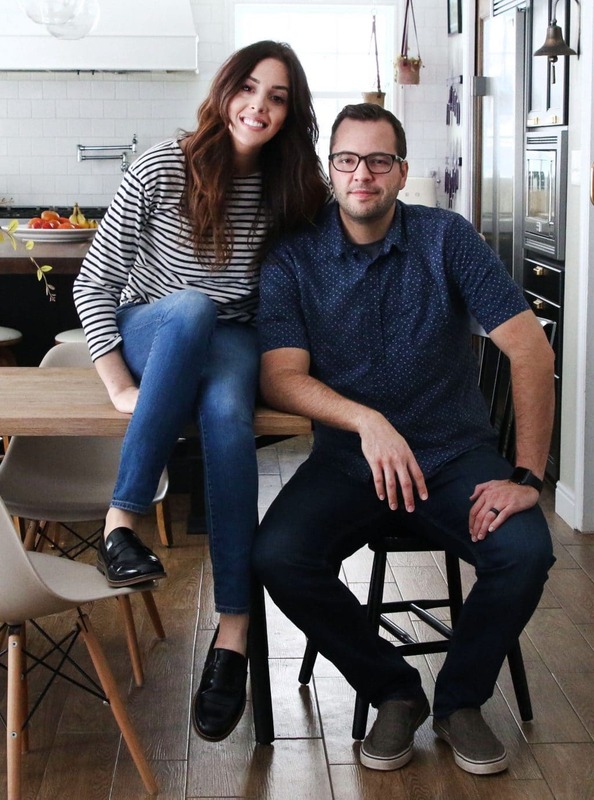 You both do such a great job making spaces beautiful and functional (that kitchen/pantry/laundry switcheroo!!!) that I think you will do something just as gorgeous and comfy here. The view is so incredible that I think you should go for luxury / fantasy more than practicality here. I would love to see an arrangement in which the head of the bed faces the view, even if that means nixing the en-suite or maybe putting a little door on each side of the headboard to get into the closet / bathroom or if that means you steal a lot from the game room . But right now this sort of looks like a cramped room that happens to have a view rather than a fantasy.master that is all about the view. If ever a room should have a Jacuzzi rather than a shower, it’s this one!!! I agree – I would really like to see the bed face the view. 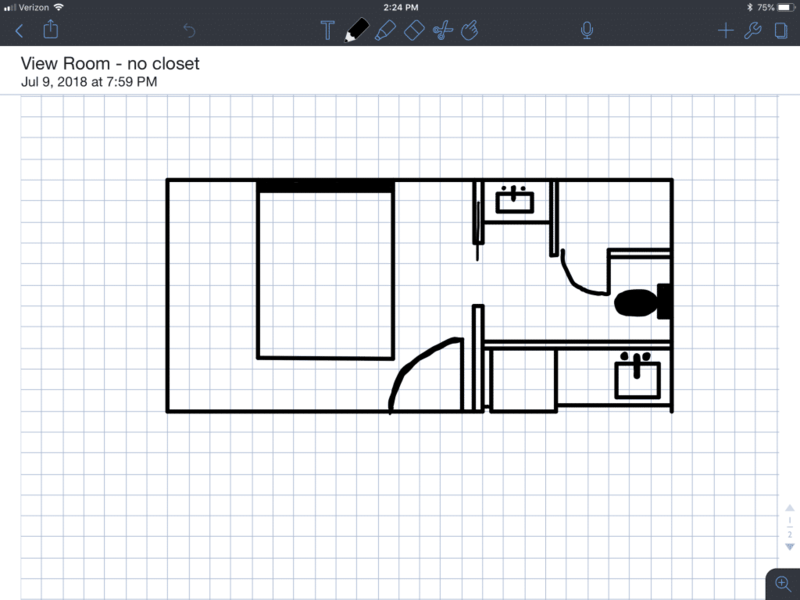 I sketched out some ideas and there’s room for it – but not if the bathroom is connected to the bed room (given the footprint they’ve marked off for this build). I think I’d forget the idea of having the two connected and have an awesome bedroom and also build in the bathroom/closet area with it’s own door. It sounds like there’s already a bedroom and a bathroom downstairs, so you’d end up with two beds, two baths and a living area. When you end up having people crash on the couches (or just hanging out downstairs) they’ll be using the bathrooms too – so that will keep it available to all and not have people sneaking through a bedroom. 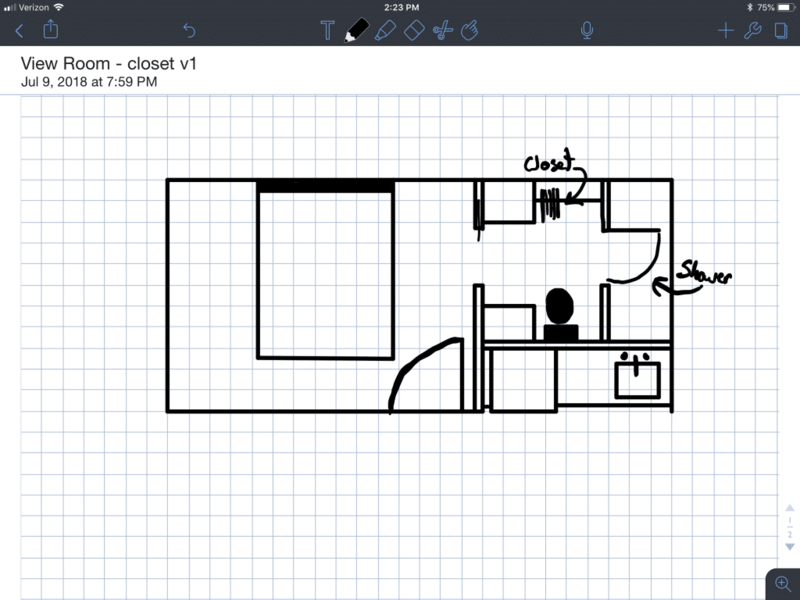 What I sketched had your basic area staying the same (bed area, bath/closet area and fridge area). I squared off the bedroom, added a bedroom door around the foot of the bed (bed facing out the window). I put a door to the bathroom/closet area where you have the fridge – which shortens the wet bar area but you’d probably still have room for something there. Wish I could draw a picture so that this would make sense but here goes…Where the vanity is in picture one, what if you made that a pax wardrobe closet accessible from the bedroom side, and closed off to the bathroom (maybe it’s a Canadian thing? but closet in the bathroom isn’t a thing here, or at least I’ve never seen it! Seems so odd to me!) Leave the shower in the little nook behind the “closet” and turn the toilet and vanity to be on the wall backing the wet bar area. Then you could have a much longer vanity, even shelves above the toilet. And hooks anywhere there’s space for them, you can never have too many hooks! I’d also do a sliding door on the shower so you don’t have to worry about the swing out to the toilet. I feel like this solves the need for a bit of hanging space, enough space for toiletries on the vanity and still gives a full bath. You could also put 2 small three drawer dressers as nightstands for more storage. Great post, Julia. Question – have you ever seen photos of the Coachman Hotel in Lake Tahoe? I ask because 1. it seems like kinda the vibe you’re going for in the cabin and 2. look at all the genius space-saving ideas in the rooms, especially the bathroom that kinda doubles as a closet, but still looks great! Some food for thought, no? The real question here is whether or not YOU want to use this space. Seeing as it has an ensuite, wouldn’t it make most sense to use this as the master? That said, depending on how long you plan to stay at a time that should determine whether the closet feels needed. In all honesty, I don’t think guests truly need a closet, but planning long term for your family needs should be considered too! You may want to leave “cabin things” at the cabin tucked away in a closet- you never know! That would solve the need for hanging storage as well as provide night stands (built-in charging station on the bed-level shelf would be so nice!) and drawers for unpacking (much easier to unpack with the suitcase on the bed than balanced on the toilet or on the floor of a small bathroom). Then you could have a much wider shower where it is in the second sketch, with toilet and vanity on opposite sides of the bathroom. Much more breathing room and bigger vanity to set toiletries on! Do you have another bathroom on this floor? If not could you perhaps access bathroom directly from main room ( and not have it an ensuite? ( Im from Uk where this is quite common!). if you didn’t have a bathroom door in the bedroom you could orientate the bed to fully face view and put wardrobe/closet down the side wall. I like to unpack but am happy with one outhouse free standing open wardrobe stands. There is a bedroom on this floor, but there’s currently no bedrooms with an ensuite so this would be the master. I’d want the bathroom accessible from the main room beside it. Same for the wet bar. It might be different if this were a classic house meant to house a family, but as a vacation space, why attach yourself so firmly to the »master bedroom with ensuite« structure? If there is a hang-out area next to the room, people will benefit far more from having a generally accessible loo and wet bar instead of one you can only reach by passing through a bedroom. I’d probably create an extra wall in the bedroom behind the head of the bed with the bed facing the window, access to the backside of the wall from both sides of the bed with hanging options and drawers on said backside as a closet, and then next to that on the »real« back wall a sliding door to the bathroom. With the bathroom having a second door that also opens to the main room. And in the pass-through to that door from the main room could be the wet bar, if you don’t just put it in the main room to begin with, since that is where it’ll see the most use. I agree with it being nice to have one down there with an extra little fridge, but shutting it away inside the bedroom doesn’t make the most sense. So, there’s already a bathroom accessible from the main space, but there’s no bedroom that has a bathroom in it anywhere in the house, which is why we wanted to make this an en suite. The wet bar will be for the living space. If it were a traditional house for daily family life, I could see the reasoning there. But for this house, for me optimized space management would be more important than trying to stick to traditional room amenities. “No bedroom has an en suite yet” doesn’t feel like enough of a pro-argument there for me. There are some things a vacation house might need more, possibly even just a small storage room for bags and coats and other bulky stuff that has no real room yet and would clutter up living areas and rooms. Could be though that that is partly due to me coming from a culture where it’s not the norm to aim for a separate bathroom for all main bedrooms. While I can see the appeal for every day life, it does feel a bit like wasted space in a house that serves the specific purpose of not only being a getaway for your family of five but enabling get-togethers of larger numbers of people. i go to a cottage to get away, unplug, be in nature. if you have ac going that means the windows are shut! no fresh air! can’t hear the birds and animals, wind, water etc. i wouldn’t want to spend the time in a climate controlled bubble. i personally would use shade sails, fans, cross-venting, other things that don’t eat up electricity etc to keep it as cool as you can. i dunno. We have a cabin and the basement is similar to yours, and we struggled with what to do with it. We originally were going to add some walls and make a bedroom, but opted for the toys (air hockey, foosball, etc.) and it was the best decision. Everyone ends up downstairs playing for hours. We did build a Murphy bed out of reclaimed wood (turned out awesome) on one of the walls down there so we have the extra bed when needed. Good luck! So fun to see what others do with their cabins. Ours is currently pretty close to the huge Carr fire, so we’re just holding our breath our cabin is still standing. Oh, fingers crossed for you guys! The bed should absolutely be facing the view. If you do a closet, it should be in the bedroom with luggage rack, pole for hanging clothes and some drawers. I also like the suggestion of hooks. I would want all of this tucked away and focus on a comfy bed and the view. We have rented MANY vacation homes. You need a king bed. We will not rent a place unless it has a king bed. For a couples trip, you would want multiple kings in the cabin. We always unpack toiletries and would need a place to store things – on the country, shelf under sink, and hanging. I’m wondering why you went propane furnace with separate A/C instead of a mini-split? I know it’s not exactly a design related question, but I hope your HVAC people at least presented the option! – More bathroom/closet space over extra fridge/wetbar. lots of votes for hooks! When we travel, I love to unpack our suitcase (traveling with 2 toddlers = sooooo many clothes) but I stick with using a dresser. We are not a “hang things up” kinda family when traveling. Our main use for closets has actually been as a place to stick a pack n play, or to set up our older toddler’s air mattress. I doubt you’d have enough space in this area to get a closet big enough for either of those uses lol. I’d say as long as you’re not concerned about not technically being able to call it a bedroom bc it has no closet, I’d go without, and just include roomy dressers or an armoire in the bedroom. I would not sacrifice the wet bar, I think it would get used WAY more than a closet in a rental. Just make sure there’s storage somewhere in the basement for extra towels & linens! How about some custom cabinetry built in either side of or around the head of the bed, with drawers and hanging space? 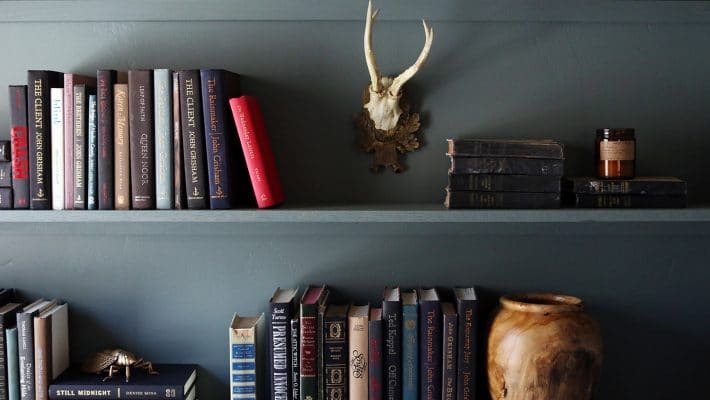 I really value a space to put things away and hide the mess – you’re building a beautiful house/renting a beautiful house, I still want it to be beautiful and not full of bags, clothes and suitcases. (Adjusted to your style of course). I’ll be the voice of dissent here, I don’t truly unpack unless I’m staying a week. A small chest of drawers is nice but you know what’s even better? HOOKS. Loads and loads of them, shaker style, for hanging up slightly sweaty play clothes, drying swimsuits, putting away jackets, etc. It’s neater than a pile but less work than drawers. I vote to drop the wet bar. Taking up too much valuable closet and bathroom space. I never see anyone use a wetbar. Can’t wait to see how it turns out. We’ve had a vacation cottage for years and we’ve never unpacked. How much other storage do you have in the basement? If there are other closets with room to store games, bedding, paper towels, etc., then I would consider getting rid of it and having just a butler in the room – something with a luggage rack and a spot to hang a few things. Personally, I’d layout the room/bedroom/bathroom whichever way you want it. Yes, you’ll have renters for a few days at a time but a visitor is going to be cool with pretty much anything as long as it’s not super strange – part of the fun of getting away is trying something different for a few days. Unless the commode is next to the bed I really don’t see anything being that big of a deal. I would even consider getting rid of the shower completely in that room if there’s another downstairs. Part of the reason you’re building this room is to take advantage of the view – if there would be room to add a chair or two I would much rather have that then a shower. Very cool plan! My vote is for a small amount of storage space – I like to unpack, but a few drawers and small hanging space would do the trick. Maybe shrink your bar area in favor of a small closet (where the fridge is in your layout)? Would a dorm sized fridge work down here? That would keep the bathroom open, which might be important for older guests. Love hearing about your thought process, it helps me think through spaces in my own home! Thanks for sharing! LOVE the idea of adding the en suite. The big couch and wet bar are great. Allows a lot of flexibility for you and renters–downstairs can become the “kids” (or teenager) zone and upstairs can be for grownups, or vice versa. Recommend making sure either the couch is wide enough to sleep on or is a pullout for more sleeping options. Overall I’m on the fence about the NEED for a closet, but am firmly on team “No open clothes storage in the bathroom directly across from the toilet.” I’d rather have no closet than that situation, which would draw my attention to the issue and kind of gross me out (flushing toilet . . . my clothes . . . yuck). I’m fine with connected closets and bathrooms, but there should ideally be some space/curtain/door/separation between the two. 1) like some have mentioned, take the closet out of the bathroom and make a small “linen closet”-sized closet on the left. You could put shelves at the bottom (can serve as storage and a luggage rack on top) and a rod above, with another shelf at the very top for extra linens. Not sure about the door–seems like you won’t really have space for a barn door, but maybe a regular swing door would work, or a curtain if it gets really tight. Then, completely agree with the earlier suggestion to put the toilet “behind” the closet (on the left/exterior wall) and extend the vanity along the right/wet bar wall. Keep the large shower all the way across, and either put the door in the center, or do a tub/shower combo with a curtain. 2) what about rotating the bed to face the windows (right now its two and a half “squares” away from the wall, it could be that close to the windows and feel more spacious because of all the glass) and then “float” a wall behind the headboard. You could us that “room” for storage in the space between the “headboard” wall and the bathroom. It would be tight on the sides of the bed, but you could do a floating shelf or stool nightstand on either side and nobody would even blink. The new space could be basically open just with a shallow enclosed closet at the far (exterior/back/left) end and then a bunch of hooks along the floating wall (behind the bed but opposite the bathroom entrance). Depending on the exact dimensions, this might give you more space to bump out the bathroom a few inches and expand the shower a bit. This plan could possibly allow you to move the bathroom doorway closer to the room entrance which might help with the positioning of bathroom essentials. This creates a little more privacy for the occupants of the bedroom–when people in the entertaining area use the restroom they won’t be walking straight into the bed; the separation makes the bedroom portion of the en suite stay private even when the bathroom becomes “public” (which it definitely will!). Love hearing your thoughts and design process! Can’t wait to follow along on the journey! I would suggest using version 2 but make the door to the bedroom a pocket door. Then make the cabinet next to the toilet a small closet that opens into the bedroom. Then use the “closet” area in the bathroom as a larger vanity. Also, if there is any way to push the room further out into the game room, then orienting the bed to face the window would be nice too! Agree with others about the bed facing the amazing view! But then that causes issue with your bathroom doorway. What if you put the bed facing the view, put a wall behind it leaving a doorway to a small closet (behind the headboard wall) and also an entrance to the bathroom? I like the idea of having the bathroom in that room. I also agree it’s nice to have a space to hang dresses etc when you are traveling and it looks like a lot of people agree they like a closet space. What about a really cute clothing rack to put against one wall when it’s being rented? Pottery barn has a nice brass one…. just a thought! While I’m sure either option is fantastic. I literally cannot remember a single time I unpacked my suitcase on vacation- id go for the spacious bathroom! I always, without fail, unpack when I’m staying anywhere more than one night and it makes a big difference in my ability to enjoy a place. I’m sure this sounds ridiculous, but I struggle to sleep if things feel chaotic around me. Our lake house bedrooms are on the small side, so we found small dressers to use as night tables (IKEA Rast 3-drawer chest). It’s the perfect way to have space to unpack without taking up too much space in a small room. If I’m staying for anything longer than a weekend, I appreciate a closet and a dresser so I can unpack properly. Not sure if this is the case for Idaho but a room in GA cannot be considered a bedroom unless it has a closet. So for resale, it’s important. I vote for a closet kind of something. In the bedroom. I am a closet person but not totally sure I love this layout. What if you divided the current bathroom in half to make a narrow bathroom. Pocket door opens to a sink followed by a toilet followed by a wider shower. The closet on the other side of the wall would only be as deep as needed for the vanity and toilet and then it would end, leave room for a wider shower. With this plan, you could achieve what so many people are mentioning….being able to close the door and not see their stuff while on vacation even if they are still living out a suitcase. You are also still able to achieve a deeper shower even if you sacrifice the vanity area. I wish comments could come with attachments and I could draw this for you! Looks like the wet bar is the thing that’s making the bathroom/closet situation a problem. The kitchen is at the top of the stairs AND you’ll have two sinks on the lower level with the bathroom addition. Would it make sense to remove the wet bar and let the bathroom/closet breathe? You could do a legit closet to the immediate right of the bedroom entrance and put a large shower right behind it leaving the exterior wall available for a large vanity and toilet. This finished space will be so beautiful! I think maybe one of those hidden, pull-out drying racks could be enough storage space for this bedroom. That way you’d have hanging space or a flat lay space that folds up and away. Including some wall hooks may be nice as well. I didn’t read all the comments besides the first so I hope this isn’t repeatitive but I agree about drawers / vanity in the bathroom! It’s needed! And an idea for storage, I’m terrible w scale but what if you had two shallow nightstands/dressers and then shelves above that, kind of like a built in look around the head of the bed? Room is roughly 9×11? Wonder if the 25”-ish space at foot of bed is a little tight. Might be worth pushing a bed in another room that far from the wall to make sure. Excited to see you guys make your dreams a reality! Keep up the good work! Because there’s a living/entertaining space right there, it seemed nice to be able to stash extra treats/drinks and it’s never a bad idea to have multiple fridges in a vacation home. I think you could nix the wet bar. While extra fridge space is nice in a home (we have an extra fridge and freezer) I don’t think it’s necessary in a rental. What you bring in you have to bring out and I don’t think people staying for a weekend will take the time to load up two fridges. If you think you need it, you could do a small bar fridge and small sink lending more room to a closet. As a renter/traveler I like having a few drawers or shelves, but am okay with just a luggage rack. Vanity counter space is an ABSOLUTE MUST. Nothing worse than having no place to put your toiletries bag. I just added a valet rod to our guest room for the rare instance someone wants to hang something. Tons of great fold-away options exist. Simple shaker peg rails would be pretty great down there (and accommodate hangars when needed). I agree with the comment that hanging space is less necessary in this cabin than in a city or resort rental. 100% agree! I never use closets/dressers, I’m a pull it from the suitcase kind of girl. Definitely would rather have bigger shower and more vanity space for toiletries! I would go for a small set of drawers and stylish clothes rack or butler stand for hanging items. 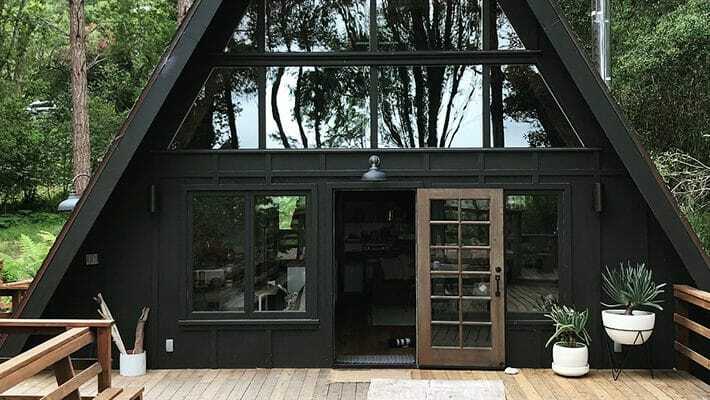 We did the same in the upstairs bedroom of our a-frame weekend home and it’s been more than enough for guests and renters. The closet just eats up too much space. Great use of space downstairs! My husband and I rent out our own townhome in Tahoe and it has a very similar layout with a loft, main space, then bedroom/gameroom downstairs. I would highly suggest trying to put a closet in the bedroom. With rental companies, they usually require you to have enough linens to book rentals back to back, which means double the towels, blankets, pillows, linens for each bedroom. The actual renter may not use the closet, but you may depending on how the needs change over time. That being said, I would move the pocket door to be on the right side when looking at the bathroom from the bedroom and insert a small closet on the left with a bifold door or something (bifolds probably aren’t ideal but I cant think of something better right now). Then between the closet and shower you can put the toilet and have a longer counter area that faces the kitchen. Maybe even add a small window above the toilet for some extra light?? This does screw up the symmetry of the doors, but if you’re renting it out, a tub/shower combo may be better for guests with young kids. Good luck and can’t wait to see the progress! I don’t think you need a closet – you need something dresser-like or with cubbies, and SOMETHING for hanging — either a standalone rack or many hooks. But do MANY HOOKs anyway!!! especially for the bathroom side. I agree with what someone said earlier about wanting to keep their makeup-toiletry bag out in the bathroom — you need a shelf or something if there’s not a lot of space on the vanity. This house is going to be sooooo beautiful. When I travel, I use my suitcase to collect my dirty laundry, so I definitely need some place to unpack. I prefer a closet to a dresser because the closet can contain everything (suitcase, clothes, shoes) and keep it all out of sight. I don’t want to see a mess (even if I’m the cause of the mess) on my vacation. If I’m reading the second plan correct, the shower will be 30 inches wide. This Spring we rented a cabin for a week and the shower was 33 inches wide. We found it way too narrow to take a comfortable shower. As much as I loved the cabin and the view, we will not book it again. As long as there are other closets or hooks to hang a few things, I don’t think a closet is necessary. A larger vanity is a must, unless there is a shelf to put things on. What about one of those fancy hanging racks that all of the fashion bloggers seem to have in the background of their bedrooms? I’m personally not one to unpack, but I did use a hanging rack recently when it was there in the corner of my little hotel room. First off, I love your posts. The two of you have great taste and vision. I’m thoroughly enjoying following along on your journey! In answer to your question, I would expect some closet space near the bedroom/bathroom. I may not use it much, but I guarantee I would miss it if it wasn’t available. Also, I love the longer shower idea. I wouldn’t need a closet and breathing room in the bathroom is a must!! I unpack 100% of the time I travel, even if it’s a short trip. It’s just how I’m wired. If I had any dresses or nicer clothes with me I would appreciate somewhere to hang things, but I think in a mountain house you could probably get away with a small dresser. I so agree with everyone who mentioned MORE HOOKS! We stayed at this cabin on the shore of Lake Superior this summer and it was wonderful! The views were spectacular, the linens were soft, but man, give me some hooks in the bathroom and in the entry! I have noticed this with more VRBO’s that we have stayed and and can’t quite figure it out. Do people take them? Rip them out of the wall? Is there something in the VRBO handbook that says “no hooks”. I tend not to put things in closets because it’s easy to forget them if in a hurry when leaving. I still like to keep things fairly organized and looking neat when we are on vacation, and hooks are a nice temporary way to do that in my book. I’m so enjoying watching what y’all are doing with the cabin. My two cents as a renter- I don’t care much about a closet, we really are the type of people to live out of our bags. We do rent a cabin about once a year and two things we always look for- hot tub and pool table. I think you need to do what works best for your family but if rental potential is a bigger priority then I’d consider making that level a game room with a pullout sofa. Don’t ditch the bathroom though! 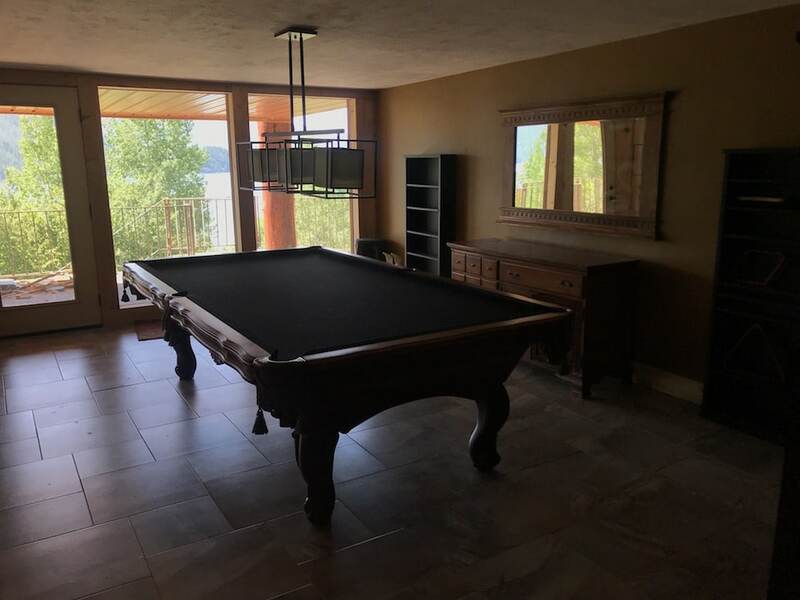 One other thing I’d add is that this past Christmas we rented a cabin and in the game room there was a pool table and a shuffleboard table which ended up being the biggest hit for all ages. 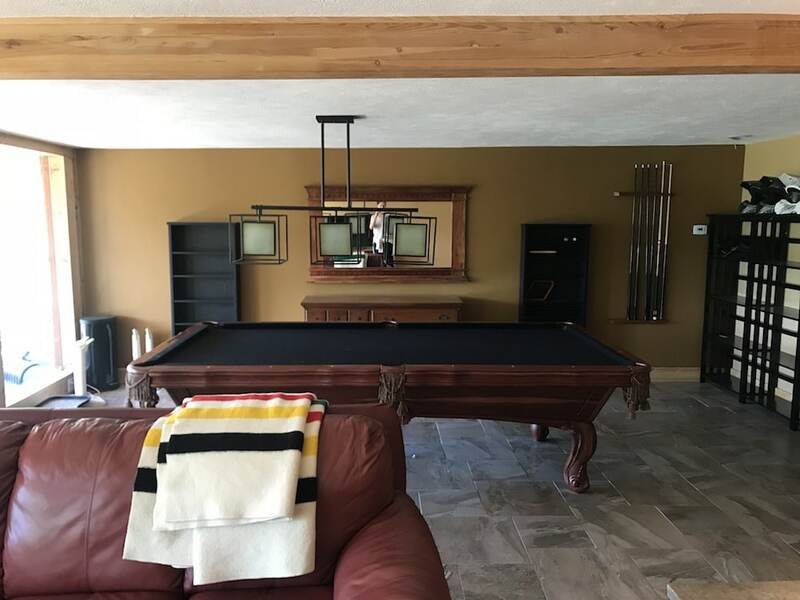 Because they’re long and narrow and you can put it up against the wall that may be a good option as an alternative to the pool table. Just a thought! I know whatever you do is sure to be amazing. HI– LOVE this idea. I personally would not like open clothes hanging bar in the bathroom. I wouldn’t want my clothes to be damp. Also, why not a pocket door TO the bedroom? I’d way prefer a rack in the bedroom to a closet in the bathroom. Assuming the closet doesn’t have a door to close, if people flush the toilet without closing the lid, particles of human waste get sprayed all over the room (and, presumably, all over ones clothes if they’re in there). Even with a door, I don’t think it’s a very convenient arrangement. Where do you open your suitcase to unpack into the closet? Balanced on the toilet? On the floor? As always, I’m excited to see what you do with it! SO smart to turn that space into another bedroom and bathroom! How many beds/baths will your cabin have with these additions? It will add a lot of versatility for your renters to have a second master. How committed to the wet bar are you? Could you use that space for the bathroom and add a dry bar (fridge and microwave) on the TV wall? No closet! The only items I unpack when traveling are “nice” things, like fancy dresses, that I don’t want wrinkled, but a hook on the back of a door can accomplish that just as well. I would much rather have a spacious bathroom. How about a pocket door into the bedroom. A partial wall between bath and bed open on each end (and perhaps at top), and much closer to window. Now bed is centered on wall looking out the windows. (That would be the biggest plus for me. Narrow closet cabinet along the length of the wall on the back side (basically behind the headboard but inside the bath.). Arrange bath in remaining area of bath, which can be vetted and exited from both sides of the bed (perhaps pocket doors there too. Or none. Just one for the toilet.) Might still be room for wet bar with moving the wall closer to window, but I would move it elsewhere in order to make the bed/bath feel luxurious. I like this idea. The bedroom doesn’t have to be very large since it is for vacation and you also have that great deck to walk out on. The closet area could have doors to protect the clothes. Would the closet system you just put in your house work in this area? If it were me, I would prefer to have a place to hang clothes, even if it was a pretty small closet. The last cabin we stayed in had no where to hang clothes in our room. No fun having to go out and get clothes every time I needed to get dressed. The only time I pack my clothes in a suitcase is when I’m flying, so usually always need somewhere to hang them. Also, I rarely ever unpack my suitcase, so just a luggage rack is good for me! Depending on your state, you need a closet to have it be a legal, marketable bedroom or in-law suite. I do live out of my suitcase but in a nice rental like this I’d want a clear space to set up my stuff! Even if I wasn’t using a closet to hang, I’d want a dedicated spot to set up my suitcase where I wasn’t tripping over it all the time. So, if there was a table, or acloset with a low shelf for my suitcase and some hanging space above it I would really appreciate that dedicated space even if I didn’t hang much/anything. I am team closet of some kind. Even a Pax with a bar/drawers in the bedroom would work. We almost always unpack and at least like to hang up a few items, it wouldn’t have to be huge. Presumably there will be nightstands beside the bed, I think that could have drawer space covered and then everyone’s hook idea for towels, pajamas, or the small handful of things that need to be hung up would have the closet space covered. Also, if I were renting the cabin and had a dress or something I wanted to hang up, I probably wouldn’t want it just hanging in a bathroom that other people might end up using. Unless I’m somewhere for a whole week, I never unpack folded items (PJs, undergarments, pants, etc), but I always unpack and hang up shirts and dresses so hanging storage is a must. Dresser/drawers not so much. No idea how much this costs, but during a winter vacation, a towel warmer was an AMAZING amenity to dry out wet gloves, scarves, etc that were damp from snow. Personally, when we’ve rented a house for a week I don’t hang my clothes in the closet, even though it’s been available. I just live out of my suitcase and then put a few things in the dresser. It’s worth noting that what I bring is mostly casual (beach clothes) so nothing really needs to be hung up to look appropriate for our activities. When I’m travelling I rarely hang up clothing – unless I brought something fancy for a special event. I feel like people coming to vacation at your cabin will not be doing things that need fancy clothes, but maybe that’s wrong! I would be happy with a couple of good sized hooks to hang a sweater or two on. And also a luggage rack or table to set my suitcase on – so I don’t have to bend down every time I need something. I personally would prefer a bit more space on the vanity to set my travel toiletries bag. If I was just renting out the cabin for a few days, I would probably live out of my suitcase. You could have a portable hanging rack as well, but I don’t think you’d need a closet! I think a closet is unnecessary. I’m looking forward to seeing the changes! That’s a beautiful view to wake up to; I like the idea to use the space for a bedroom. To answer your question, if I were renting this cabin, I most likely wouldn’t need hanging space. I don’t mind living out of a suitcase for a short time, but more than a few day and I’m wishing for some shelves or drawers to put stuff away. A few hooks would do for something that needs to be hung. Hooks are also handy for bathroom kits. Oooh, team drawers + hooks all the way. Love the idea of adding another bedroom! Definitely prefer roomy bathroom no closet. The clothes for enjoying the cabin are not hang up anyway. Can’t wait to see it! Could you turn the closet access to the bedroom? Just make a cubby into the bath area. You could then do a proper door into the bath since it would be Wall not dresser. Just a thought. For travel, most people only stay for a week so not much hanging space is needed. I think shelves or drawers are more functional for unpacking. We stayed in a vacation rental that had empty bookcase shelves (15 in deep) and that was helpful to put clothes and such on while staying there. I like this! Turn the closet to be some drawers with a rod up top (like 1 ikea unit) that opens into the room. smack a door on it that lines up with the door the bathroom? I like the second option best. It would be nice to have a place to hang up your wrinkled clothes by the shower and I don’t really care how spacious a bathroom is when I’m just visiting. When people come to our house they always hang stuff up in the closet of our guest room. I love the idea of having a small closet space in the bathroom. Even though I know you want to rent you will also using this space for you and your family and I think for longer stays people will enjoy being able to hang clothes up vs. just living out of a suitcase. I love being able to place my clothes in a dresser so they do not retain that “suitcase” smell they inevitably get even after a day or two. I think Scott and Kim (at Yellow Brick Home, obviously, I pretend like I know them haha) had a great solution to the guest-room-debate: a combo luggage rack and hanging rod in the bedroom itself. Especially since I doubt people will be bringing fancy clothes to the cabin — if your rental was downtown NYC, sure, people would bring dresses/suits for fancy nights out, but I don’t think that’s the case here. You could also put some cool hooks somewhere as a decorative element on the wall in the bedroom or bathroom, so that they could be used for combo hanging clothes/wet towel use. I’ve seen those in a couple VRBO rentals and I thought they were so handy! More open bath with larger vanity. Smaller wet bar with a closet. I need/want 2ft of hanging space with room for a suitcase rack under hanging rod. We always unpack our suitcase and use any drawer and/or hanging space available. Great plans! Can’t wait to see what you’ve decided! My family of 14 (Grandparents, children and grandchildren) JUST rented a cabin for a big family get away a few weeks ago! The bedroom idea is fantastic! I’m a live-out-of my suitcase type of person, so I would never use a “closet” especially at a cabin. Cabins are already chill and comfortable, no formal wear needed ;) BUT our room at the aforementioned cabin had some really cute hooks and a bench that we actually used and found very handy! It was a great place for sweatshirts that you would want to grab later at night when the temps cooled. I always keep everything in my suitcase unless there’s a dress or nice outfit that i don’t want to get wrinkled. My husband always unpacks and puts things in drawers and closets and it makes me feel like a scrub. I will sometimes hang a few things up so I can pretend I’m more sophisticated than I am. Love this! Personally I think the more storage friendly bathroom. 1. I think while you don’t necessarily need a full closet, you want something for guests to hang things from. So could be a standing thing in the bedroom if it’s big enough, or some valet hooks? 2. With the second option YOU CAN SEE THE VIEW FROM THE SHOWER!!! 😲😲 I would be all over that. And I think it’s totally worth a smaller vanity. I am so excited for this transformation!!!! I prefer a closet, how you have it laid out would totally work for me! I almost always set my suitcase on the luggage rack. Even if I have hanging clothes, it’s never that much (especially in the mountains). I could get by with a couple wall hooks and call it a day as I much prefer a little extra bathroom space. No closet necessary for me. Shoot, if somehow that shower/tub situation had a view straight from that back wall in the bathroom….aces! I’m so excited for this transformation! I would like the option to have a mini closet, but not in the bathroom. What about a pull out closet rack in the main room? Or a stand alone rack could be cool looking! From a female perspective, I would leave my makeup bag on the counter rather than put it away, so either open shelf below the sink or a larger vanity would be needed than the idea in plan #2. That being said, closet space would be nice so that you can hide your bag and keep the room “pretty. What about doing a sliding door into the bedroom and have his/her pax wardrobes on either side of the bathroom entrance? When my husband and I go on vacation, we LOVE suites with really luxurious bathrooms, because it’s something we don’t have at home. So, showers with double shower heads, bathtubs with views (if there’s privacy), things like that. Sometimes it feels a little cheesy like an over the top honeymoon resort, but it’s not something most people are going to put in their own house, but will enjoy on vacation. And when little ones are in tow on vacations, it can’t hurt to have a nice space to retreat to! That will be an awesome room with a view, kudos for figuring that out! When traveling we usually live out of a suitcase, but it is nice to be able to hang a few pieces. Luggage racks would be nice to have too, and those tuck away easily. Can’t wait to see the renovation! Sometimes it’s nice to hang a dress or a suit up…but I probably wouldn’t have those with me if we were at a cabin…for the most part I always just live out of my suitcase when on vacation! I’m excited for this to get built! Wouldn’t it make more sense to orient the bed directly toward the view? The head of the bed could then become a room divider that has suitcase and hanging storage. Leave the bathroom open to the bedroom except for a toilet closet? Right now it all seems a bit choppy, and if you’re giving me a view I want to see it. Yes! I was thinking this exact same thing. Another vote for having the bed face the view! I would nix the closet and go for a dresser and luggage stand in the bedroom. I rarely hang things on vacation, and would much rather have some space to move around in the bathroom. Love you guys will capture that view in a bedroom! I wouldn’t care if there were no closet, so long as a nice luggage rack and some hooks were provided (and hangars somewhere). It’s looking like a great plan! It depends how long I’m staying, but I’m typically one of those that keeps everything in my suitcase unless the storage options are incredibly convenient. Could the nightstands dual function as small dressers? I like option 1 better, option 2 seems quite cramped in the bathroom. You could always get a bed with under bed storage drawers. Also, a good place to hang things to dry. Swim suits, towels, life vests, snow gear, etc. Every beach house I’ve rented was lacking this, and I imagine it would be the same near a lake. Love the idea of the bedroom with a view! We stayed at an airbnb last May and it had no place to hang clothes. It was a real bummer. Guests definitely need a place to hang clothes. We never use drawers unless staying for more than a couple of days. A luggage rack is also a must. It will be nice to have another bedroom, but is there no way to also have a couch/TV in one corner? Since you’re doing the wet bar and kitchenette, it might be nice to have a spot to hang out without having to sit on the guest’s bed. I just hate the thought of entirely removing the “fun room” factor, so wondered if you could make it serve both purposes. I prefer to unpack and have a space to tuck away my luggage. I always feel at rentals there are never enough drawers or hooks. I always wish there were hooks for holding bags/jackets/towels/hats so things don’t pile up everywhere. Closet! That way when you use it for yourselves or extended family, they have a place for their things too! I don’t think its worth having a closet, unless you yourself plan to leave any clothing there, but maybe thats just a locked closet to store your things and not available for your guest? Leave like a couple winter jackets, snow pants, boots, gloves, etc. Love that you’re turning this area into a bedroom! Re: closets- it depends on how long I’m staying- if it’s less than a week, I use a luggage rack, if it’s more than that, a small dresser would be helpful but wouldn’t be necessary (I’ve never utilized hanging rods while on vacation). Also- personally, a bedroom missing a closet in a house I’m renting isn’t a turn-off. I probably wouldn’t even notice as long as there were luggage racks to use. I absolutely seek out vacation rentals that have some sort of family space, especially with entertainment such as a pool table or ping pong. As a renter, I’d much rather give up a private bedroom to a pull-out couch and entertainment room. I almost never unpack much on vacation. I might hang up one or two things, but that’s it. I go into full-on lazy mode. Ha! Have you considered a pocket door instead of the swing door? Personally, I would add the closet since, in the future, if you resell, then it can be officially be considered a bedroom. Love the ideas and can’t wait to watch the progress. Cabin clothes are not generally clothes I’d need or want to hang up. I’d prefer alllllllll the hooks instead, especially if you put a hot tub outside. An ottoman or a bench for suitcases is all you need. Hooks are a great idea!